Belt Buckles have always been a great way to advertise your company's logo or to enhance your uniforms. At Gold 'N' Things, the finest quality buckles are available in die-struck solid brass, zinc or white metal castings. With a wide assortment of plating finishes, we can add the final touch to your buckle needs. 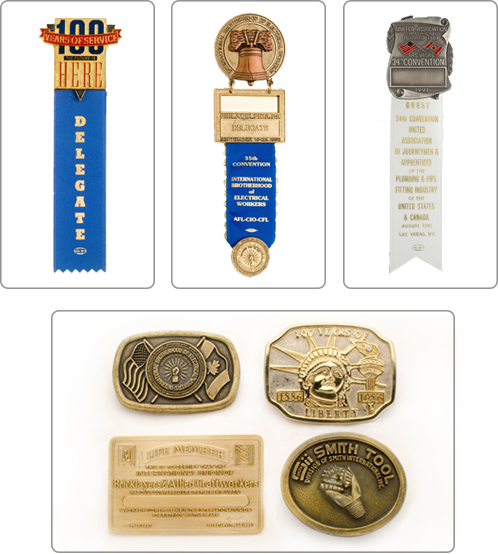 In addition, we offer the capabilities to produce a range of custom made convention badges or awards. These products are also available in brass, white metal or zinc die-cast and can be appropriately finished with your choice of plating. Whatever the needs of your organization may be Gold 'N' Things can help.